All four of the indexes in National Multi-Housing Council’s July survey improved but remained below the 50 better/worse boundary bringing the average up to 46 from 39. The Debt Financing Index was less volatile than usual, rising to 47 from 46, about a third of its average quarterly move. I suspect that baring another 2008-like meltdown the Debt Financing Index may smooth out somewhat as non-bank lenders become more mainstream in the apartment sector. 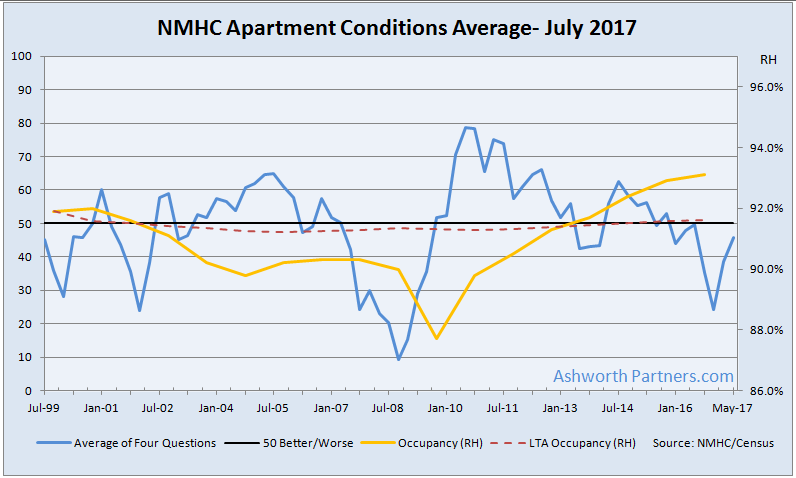 My Take: The NMHC Index Average has been in negative territory for a year now and while rent growth and occupancy in Class A are feeling the effects of all the new supply coming online (and about to), Class B & C are still extremely tight and will remain so until we figure out how to build new Class B & C apartments. A side effect of this is that we’re seeing both renters and investors willing to venture out from the urban core to the further and further outlying areas. A recent study showed that there are 5,000 folks from the Bellingham, WA area (my hometown up near the Canadian border) commuting south 90 miles every day to work in the Seattle area. Previous Previous post: Falling Spread Helps Apartment Loan Rate Weather Rise in 10yr Treasuries. Next Next post: What do FHA mortgages, shopping malls, urban renewal, master planned communities, Architect Frank Gehry and LITCH housing have in common?